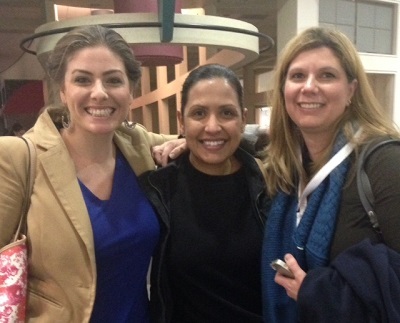 Mindy, Jennifer, and I had a great weekend at the Rocky Mountain Dental Convention! We took some classes on our own, but my favorite was the periodontal course we took together on Saturday. I feel so lucky to have these amazing, forward-thinking clinicians on my team! Most of what we’ve all been taught about periodontal disease is related to removing bacteria and attempts to sterilize the mouth. This lecture focused on your body’s response to bacteria and how we as clinicians can handle your body’s reaction to inflammation. In short, the presence of bacteria is not always enough to constitute disease. It is your body’s response that we have the capability to modify in order to protect your whole body health. The greatest issue with periodontal disease is that it is usually painless, leading most people to ignore the signs and symptoms. Did you know that the surface area of the pockets around your teeth is about 2x2inches? Could you imagine having a 2×2 inch area of stinky puss and inflammation right on your arm? Even if it didn’t hurt, you’d definitely worry if it bled every time you touched it. So why would you ignore your gums if they bleed every time you brush? We know that periodontitis is significantly related to chronic inflammatory diseases such as diabetes, rheumatoid arthritis, and cardiovascular disease. Coincidence? Definitely not. These diseases are based on oxidation, meaning that free radicals in your body are looking for a free electron to steal, causing a negative chain reaction like dominos. Antioxidants bond with free radicals so that the chain reaction is stopped before vital cells are damaged. Interested in how antioxidants may benefit you and your periodontal condition? Are you curious about your mouth’s reaction to inflammation? Give us a call to learn more!